Former U.S. Secretary of State George P. Shultz PhD '49 entertained an MIT political science class last Thursday by speaking on foreign policy issues concerning Bosnia, Somalia, Russia, and U.S. economic interests. He also recounted his experiences during the Reagan administration. The visit was arranged by Professor Stephen W. Van Evera, who teaches American Foreign Policy: Past, Present and Future (17.403). Shultz said that U.S. policy toward Bosnia needs more "strength" instead of diplomacy. Because "the United Nations is diplomacy without strength," the United States needs to take more action, he said. Shultz argued that the current arms embargo is a failed diplomatic action. According to Shultz, the embargo empowers the armed Serbians against the unarmed Muslims and makes this an unfair war. Reasons behind a weak U.S. policy include President Bill Clinton's changing views and inability to back diplomacy with force, Shultz said. He said that when Clinton, as a presidential candidate, threatened force, the Serbians "cooled down." Since taking office, however, Clinton has not taken any action, so the Serbians resumed their attacks on the Muslims, he said. "Diplomacy doesn't take place in a vacuum, it takes place with strength," Shultz said. Shultz called the human rights violations in Bosnia a "catastrophe, a human tragedy, a moral tragedy." Shultz also disagreed with U.S. policy in Somalia. Shultz said that Clinton's guarantee to have the troops home in six months was a big mistake. "You can't give away power by conceding a pullout." He added that Somali warlords will just wait it out. He said this type of action gives the impression that the United States cannot stay for the long haul. Somalia is another failure to properly use force and diplomacy, Shultz said. In such a situation, the United States should send in troops to bargain for diplomacy or establish peace. Once peace is established, however, the operation should be turned over to U.N. peacekeepers, and troops should be pulled out completely, he said. In other foreign policy matters, Shultz discussed possible nuclear threats to the United States. "Nuclear weapons in Russia [and the former Soviet Republics] could destroy the United States in 30 minutes," Shultz said. He cited the remaining presence of Soviet troops in other republics, such as Georgia, and Russia's refusal to allow Poland from joining the United Nations, as proof that Russia maintains a threatening sphere of influence. Despite the present turmoil in Russia, Shultz predicted that the Russian economy would certainly improve once these resources were converted from the military to industry. "They have great scientists, great engineers, and probably the world's best mathematicians," he said. Shultz opened his talk with a few humorous anecdotes taken from his newly published memoirs, Turmoil and Triumph. In a 1982 trip with President Reagan to Brazil, Shultz woke up one morning to see the presidential motorcade drive away from the hotel to the U.S. embassy without him. He quickly called a cab, and raced down to the embassy, arriving just in time to be introduced to introduce the President. Shultz added that that was when he realized the low stature of his office on presidential trips. Then, Shultz recounted one of Reagan's verbal slips on the same Brazilian trip. During an embassy dinner, Reagan stated, "How wonderful it is to be with you here in Bolivia." After a press frenzy, Shultz and Reagan arrived in Sao Paulo to a banner that read, "The People of Bolivia Welcome the President of Canada." Shultz added, "The Brazilians have a great sense of humor." Shultz reiterated his support for Reagan's Strategic Defense Initiative program. He also supported Reagan's arms buildup, noting that it followed the "negotiate from strength" principle. Such actions helped the United States win the Cold War, according to Shultz, who gave credit to the Reagan administration and called his part in it one of his biggest accomplishments. The current downsizing of the U.S. military was a "mistake," Shultz added. However, he said the downsizing was part of a cycle: large build-up, peace, downsizing, threats, and build-up again. In the economic spectrum, Shultz, supports the North America Free Trade Agreement. Although he acknowledged NAFTA would help Mexico more than the United States because of their relative economies, he said that a strong Mexican economy is important for the United States. He also said NAFTA may serve to decrease protectionist measures among the global economies. In addition to being Reagan's second Secretary of State, Shultz served in three previous cabinet positions. Moreover, he was president of Bechtel, one of the world's largest engineering and construction firms. 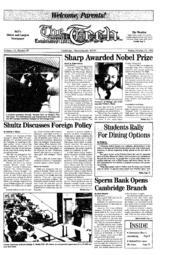 Shultz, who studied economics at MIT, also taught at the Sloan School of Management, before serving as the president of the Business School at the University of Chicago. Presently, Shultz works at the Hoover Institute at Stanford University.